Cineplex is one of the largest entertainment companies in Canada. The company continues to face declining theatre attendance in the past year. The company's diversification initiative may take longer than anticipated to help drive its top and bottom lines growth. Cineplex currently offers a 7.2%-yielding dividend. Cineplex (OTCPK:CPXGF) [TSX:CGX] delivered mixed Q4 2018 earnings. 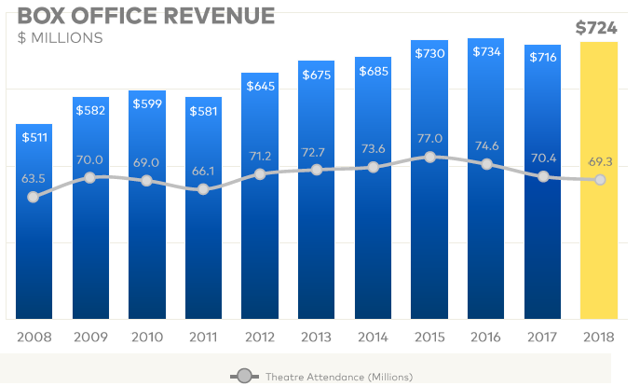 While its revenue increased year over year, its theatre attendance declined again. Looking forward, it will be challenging for Cineplex to grow its top and bottom line due to the difficulty to increase theatre attendance. Its diversification initiatives may take longer than anticipated as well. Meanwhile, the Canadian economy is heading for a slowdown in 2019. We believe investors may want to wait on the sideline until better visibility is seen. Cineplex reported mixed Q4 2018 earnings. In Q4 2018, its total revenue increased by 0.4% year over year to C$428.2 million. Similarly, its adjusted EBITDA increased by 2.5% year over year to C$81.6 million. We particularly like the fact that Cineplex's adjusted EBITDA margin improved to 19.1% in Q4 2018 from 18.7% in Q4 2017. The improvement was primarily due to its cost-reduction initiative. Unfortunately, its revenue growth was much lower than Q3 2018's 4.4% and Q2 2018's 12.4%. The deceleration in its revenue was primarily due to a decline in theatre attendance. As can be seen from the table below, its theatre attendance declined by 3.2% year over year to 17 million in Q4 2018 from 17.6 million in Q4 2017. For the full year, its attendance declined by 1.6% to 69.3 million. The company currently has three major location-based initiatives: The Rec Room, Playdium, and Topgolf. Each of the initiatives is summarized in the following figure. Cineplex currently has 5 Rec Room locations and is expected to add 5 more locations in 2019 and 2020. Cineplex plans to open 2 Playdium locations (Whitby and Brampton) and one Topgolf location in 2019. Cineplex also has a business segment that designs, installs, maintains, and operates digital signage networks in four verticals including digital out of home (in public spaces such as shopping malls and office towers), quick service restaurants, financial institutions, and retailers. We believe this segment has the potential to increase the number of installations in the foreseeable future. In addition, it will also result in recurring advertising revenues. 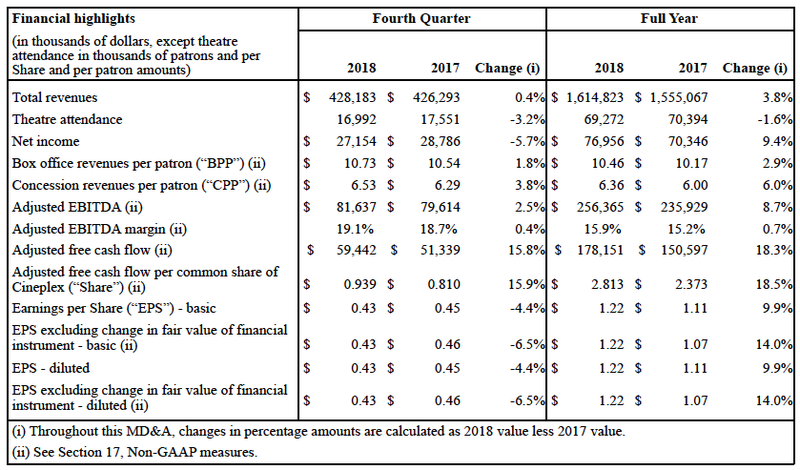 Although Cineplex was able to grow its box office revenue in 2018, the increase was primarily due to an increase in ticket price. Unfortunately, the company continues to see a decline in its theatre attendance year over year. In fact, its theatre attendance has been declining since reaching the peak in 2015. As can be seen from the chart below, theatre attendance dropped to 69.3 million in 2018 from the peak of 77 million in 2015. We believe the rise of video streaming has gradually lured people away from watching movie at theatres. Instead, people today are increasingly watching movies at home or on mobile devices such as tablets and smartphones. We believe this trend will likely continue in the near future. There may be some new movie releases that will draw more crowds to theatres. However, the impact will likely be only temporary. While the unemployment rate remains very low, the Canadian economy is heading for a slowdown in 2019. In fact, RBC Economics projects Canadian GDP growth rate to decelerate to 1.5% in 2019 from 1.8% in 2018. A slow economy coupled with high Canadian household debt (the debt-to-income ratio is over 170%) will likely influence Canadian consumer confidence. Since leisure expense is often one of the first few expenses to cut when consumers need to reduce spending, we think this will likely limit theatre attendance growth. It might also impact its revenue growth in its other segments (e.g. amusement and leisure). Cineplex's diversification strategy has the potential to grow the company's overall top and bottom lines growth in the future. However, it may take longer than anticipated. At the moment, The Rec Room only represent about 4.2% of its total revenue in Q4 2018 (about C$17.9 million revenue in Q4 2018). As we discussed earlier in the article, Cineplex will double The Rec Room locations by the end of 2020. This means by the end of 2020, revenue from The Rec Room will still be less than 10% of its total revenue. Therefore, we believe its diversification strategy may take longer than investors anticipated. In the near term, Cineplex will continue to deal with declining theatre attendance. Share price of Cineplex has declined by over 33% in the past 6 months. 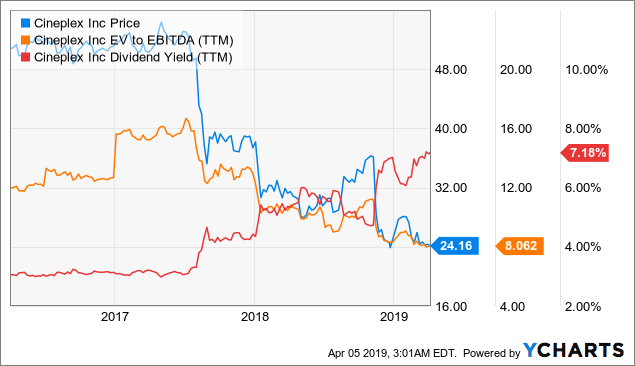 As a result, Cineplex is currently trading at an EV to EBITDA (trailing 12 months) ratio of 8.1x. This is 5.4 multiples lower than its 5-year average of 13.4x. Cineplex has consistently increased its dividend since 2011 (see chart below). The company currently pays a monthly dividend of C$0.145 per share. This is equivalent to a dividend yield of 7.2%. 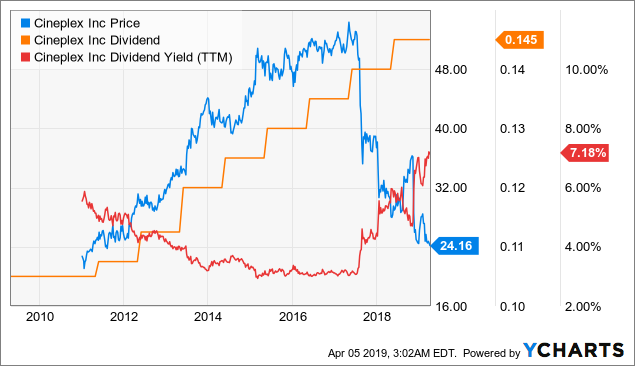 As can be seen from the chart above, its dividend yield is now the highest we have seen in 10 years. 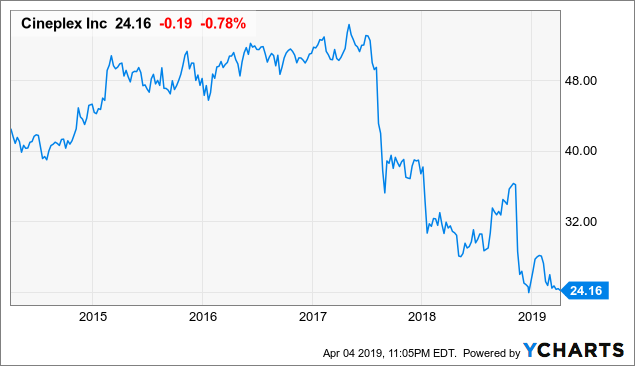 This dividend is also safe with a healthy payout ratio of 61.1% in 2018 (based on its adjusted free cash flow in 2018). As can be seen from the table below, its 2018 payout ratio was better than the payout ratio of 70% in 2017. (1) As discussed earlier, the company's box office revenue heavily depends on movie content and quality. As we know, some movies can attract more attendance while others may not. 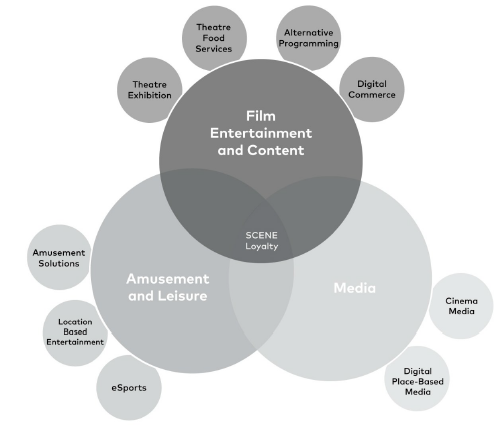 (2) Cineplex competes for the leisure time and disposable income of all potential customers. Other forms of entertainment such as the increasing popularity of mobile gaming, online streaming services can negatively impact its customer attendance. (3) Weather pattern can impact its business. For example, a severe ice storm in the winter may impact its box office revenue as many people choose to stay home instead of going to movie theatre. Cineplex remains undervalued with an attractive 7.2%-yielding dividend. We believe it has the potential to diversify its business away from its reliance on box-office revenue through its diversification initiatives a few years away from now. Unfortunately, the company will continue to face the challenge of declining theatre attendance. We believe investors may want to wait on the sideline until better visibility is seen. Additional disclosure: This is not financial advice and that all financial investments carry risks. Investors are expected to seek financial advice from professionals before making any investment.